Black and Decker has a hundred-year history of making high-quality tools. This tradition doesn’t mean they’re old-fashioned, either. Black and Decker battery chargers are some of the most advanced on the market. Smart sensors gauge your battery level and adjust accordingly, giving you safer and more efficient operation. A battery charger is a godsend for emergencies. It can also help maintain the battery in cars you don’t use every day. Read on to find the best Black and Decker battery charger for your car. 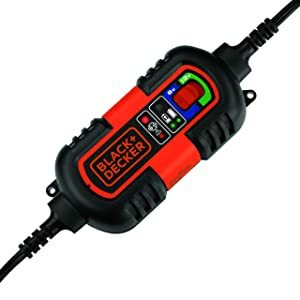 7 So What’s the Best Black and Decker Battery Charger? This battery charger/maintainer for use on 6V & 12V battery systems. Easy connection to vehicle battery. Let’s start with a model that’s designed for convenience and versatility. It takes the guesswork out of charging your battery. Simply choose 6V or 12V charging, plug it to the battery, and let the charger do the rest. It’ll charge on its own and stop when it’s ready. We love that this one comes with three different connection options. The DC plug option is what gives it so many points for convenience. Plug it into your car’s cigarette lighter and you can charge the battery without even lifting the hood. The only downside of this model that we could see is that it does take a while to charge. If the battery is completely drained, you may need to charge it for ten hours or more. On the plus side, though, the BM3B is easy for anyone to use. 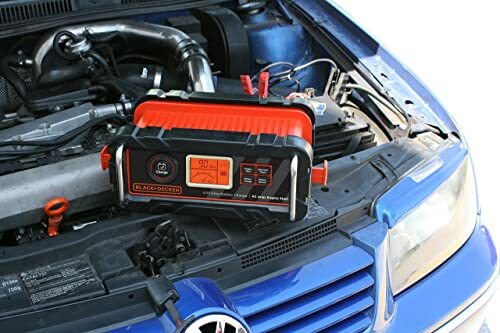 The intuitive design and automated features make it a great choice for all-weather maintenance of any car battery. BLACK+DECKER BC2WBD is fully automatic high frequency charging. Here’s another automated charger that gives you a bit more oomph than the BM3B above. 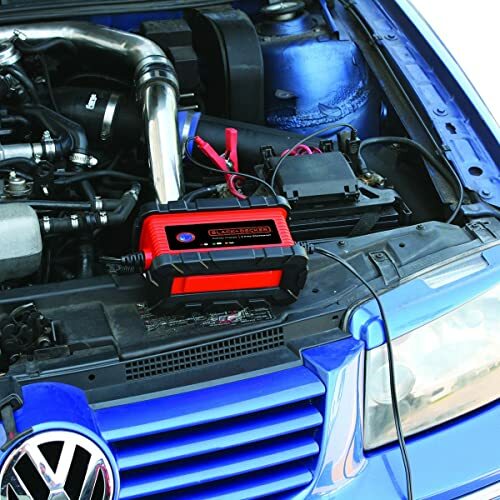 The BC2WBD is built to give any car battery a safe, consistent charge. It can revive a completely dead battery in just a few hours. It’s also perfect for long-term or off-season battery maintenance. The housing on this model is a step up from the competition. It’s completely waterproof and has an IP67 rating for marine use. That means you’ll definitely have no trouble using it for your car engine, even in the worst weather. We also love that it’s both mountable and magnetic. You can hang it easily inside the bed of a truck or the wall of a garage. And it’s not too large or heavy, either. It’s just as easy to take with you as it is to hang out of the way. The LED indicators can be a bit tricky to interpret at first. Other than that, this charger is easy to use, with automated features that keep your battery safe. battery reconditioning feature helps extend battery life. If you want speed, that means you need power. The BC15BD gives you up to a 40-amp charge with three different modes to match your battery’s needs. This translates to a fast charge—as quick as 90 seconds using the engine start feature. Even better, it’s smart enough to choose the right mode for you, giving you worry-free charging every time. The reconditioning feature optimizes your battery in less than ten minutes and helps it hold a charge for longer. You can also use the BC15BD to troubleshoot chronic battery problems. The alternator check feature will let you see how well your alternator is maintaining the charge. There’s a large LCD screen to show the battery status, charger mode, and other helpful info. Our only quibble is it might be too automated. There is no manual mode select option to choose trickle charging only. We found it smart enough to pick the right mode for you, though. It’s fast and easy to use, and perfect for vehicles of any size. Before you buy a battery charger, it’s good to understand a bit about chargers and batteries. These simple tips will help you buy the right charger and use it safely. A standard battery charger sends a consistent high voltage, aiming to fill the battery as quickly as possible. Trickle chargers send a low voltage that often varies over time. The battery charges more slowly but is less likely to overcharge. 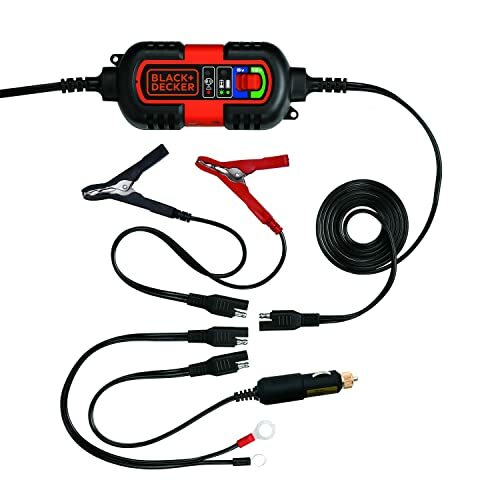 Trickle chargers are ideal for maintenance on cars that get only occasional use or batteries in storage. If you want both options, smart chargers give you multiple modes and automatically select the right one for the job. They cost a bit more but give you the best of both worlds. If you’re using the clamp or O-ring connectors on a charger, connecting them in the right order is key. Always attach the red positive clamp or ring first, and make sure it’s on the positive post. Attach the negative clamp to the post next and make sure they’re secure before starting the charger. With a battery installed in a car, you can optionally instead attach the negative clamp to the chassis. This is safer for high-amp charging but not necessary for trickle charging. The automated features on these Black and Decker models also help prevent overcharging. 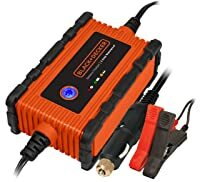 So What’s the Best Black and Decker Battery Charger? For everyday use, we love the BM3B Automatic Battery Charger. It’s small enough to stash in your trunk and easy to use from inside or outside the car. Don’t just take our word for it, though! These Black and Decker battery chargers are so handy and affordable you’d be silly not to try one for yourself.